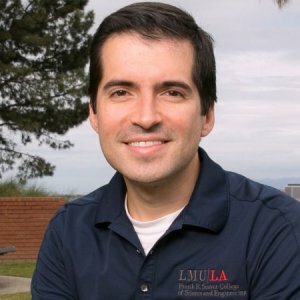 Gustavo Vejarano is an Associate Professor in the Department of Electrical Engineering and Computer Science and Program Director of the Master of Science in Electrical Engineering at Loyola Marymount University. He earned his B.S. in electrical engineering at Universidad del Valle, Cali, Colombia in 2005 and his M.S. and Ph.D. in electrical and computer engineering at the University of Florida, Gainesville, FL in 2009 and 2011 respectively. In 2006, he worked for ZTE Corporation as engineer for the deployment of a city-wide cellular network. During his Ph.D., he conducted research on wireless communication networks at the Wireless and Mobile Systems Laboratory under Dr. Janise McNair's direction. Dr. Vejarano's research group at Loyola Marymount University is the Intelligent and Embedded Networks and Systems Laboratory (Intemnets Lab) where students conduct research under his direction on intelligent and embedded networked systems. Their research has been published in journals and conferences of the IEEE. Dr. Vejarano is the faculty advisor of the LMU Chapter of the Society of Hispanic and Professional Engineers, Councilor of the Engineering Division of the Council on Undergraduate Research, and Senior Member of the IEEE. 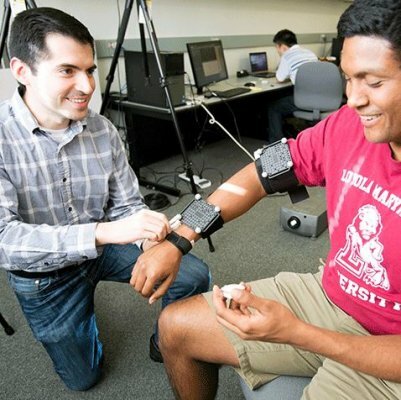 In the Intelligent and EmWireless Sensor 640x427bedded Networks and Systems Laboratory at Loyola Marymount University, Gustavo Vejarano, Ph.D., studies how wireless sensors can be used in physical therapy to capture a patient’s range of motion and help assess rehabilitation progress. But a recent project was stymied until he asked a colleague, and expert in human physiology, to lend a hand. 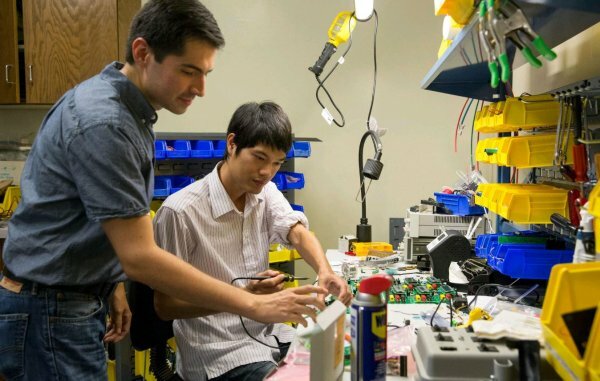 "In the Intelligent and Embedded Networks and Systems (Intemnets) Laboratory, Gustavo Vejarano works with graduate students on research projects such as the programming and development of interconnected networks that track a person's movement and vital signs. The data are then used to detect whether a patient in physical therapy is doing the exercises correctly and to analyze the patient's progress. Vejarano takes LMU graduate students to a new level by helping them develop their engineering and research skills in order to improve people's standards of living." An expert in cutting the cord, Gustavo Vejarano, assistant professor of electrical engineering and computer science, is studying applications of wireless technologies. Vejarano is researching networks of wireless sensors to overcome the limitations of infrared-based motion capture systems. Hands-on experiments in voltage, current, resistance measurement techniques, and use of electric components in simple circuit design and testing. This course is a continuation of ELEC-301 Junior Lab I with emphasis on design of both analog and digital systems. It also introduces basic programming on assembler and hardware description languages for FPGA-based system design. This course is an introduction to communication systems. It consists of three main sections. The first section introduces the concept of communication systems and the mathematical analysis of the transmission of signals. The second section focuses on analog communications systems. Finally, the third section focuses on digital communication systems. This course is divided into three main parts. The first part is an introduction to the theory of probability, random processes, and spectral analysis. The second part builds on this theory in order to perform the analysis of communication systems. Finally, the third part is an introduction to information theory and channel coding. This course is an introduction to the architecture, programming, and interfacing of the 8-bit, 16-bit, 32-bit, and 64-bit Intel microprocessors. The programming section includes addressing modes, data movement, and arithmetic, logic, and program-control instructions. The interfacing section includes memory, input/output (I/O), interruptions, direct memory access, and the arithmetic coprocessor. This course is an introduction to wireless networks. It is divided into three main parts: wireless communications, computer networking, and wireless networking. The focus is on wireless networking mainly, which covers cellular networks and wireless local area networks. Selected advanced topics will be presented in the form of student presentations, which are prepared under the guidance of the instructor. Each presentation will be a survey of the current research literature. The Graduate Seminar is the terminal class taken by graduate students in the Graduate Program in the Department of Electrical Engineering and Computer Science. It is a project-based seminar in which students are required to select, research, write about, and discuss a subject of current interest to electrical engineers and computer scientists. Students give a number of presentations over the course of the semester according to the schedule in the table below. In class meetings when no project presentations are scheduled, the seminar focuses on informal discussions of various issues and problems raised by students' projects. Students are also required to attend at least one professional meeting from a local chapter of the IEEE, ACM, or another professional society and give an oral report to the class that summarizes the technical topics discussed in the professional meeting. This course is an introduction to Information Theory and its application to the analysis of data compression (i.e., the minimum number of bits required to represent information) and channel capacity (i.e., the maximum data transmission rate over a channel). This course is an introduction to the programming and implementation of wireless sensor networks (WSN). The course follows a hands-on approach. For every meeting time, students will receive a short lecture on programming concepts, which will be followed by laboratory assignments. In the lab assignments, students will apply the concepts introduced in the lecture to program wireless sensors with the objective of having them collaborate with each other to form a WSN. This is a research-oriented course. Its main goal is to introduce students to a research topic of their choice within the broad field of wireless-network applications. Students will identify a research topic, define a research problem on this topic, provide a research plan for solving the problem, execute their plan, and analyze the findings they obtain from the execution. This is a project-based course. The objective of the project is to validate radio-propagation models available in the research literature using the signal transmitted by LMU’s FM radio station KXLU. Students need to put together the system that measures the spectrum of the received signal at different locations in the city using a laptop, spectrum analyzer, GPS unit, and dipole antenna. The data collected will be used to validate radio-propagation models students need to program using Python. •	How is information (e.g., video, audio, text, patterns) represented in binary digits? •	How are binary digits (an abstract mathematical concept) materialized using electronics? •	How do computers operate individually using those electronics? •	How do computers communicate with each other (e.g., Internet) to exchange information? The course will also talk about cybersecurity threats. Students will be required to read about a particular type of cyberattack from 3 different papers at least, write a report on the attack, and present it to the class. 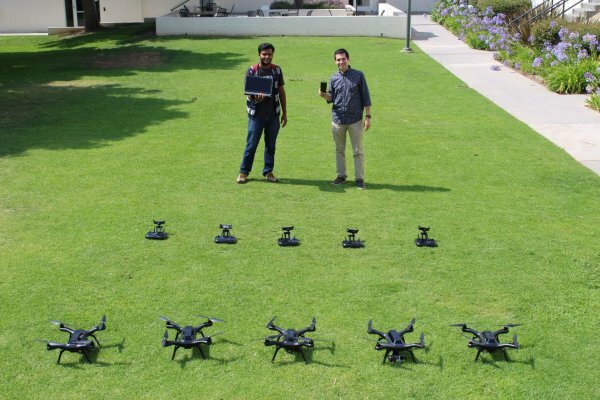 The counting of static targets on ground using an unmanned aerial vehicle (UAV) is proposed. To the best of our knowledge, this is the first paper to do such counting on-the-fly and autonomously. The flight path is programmed before take-off. The UAV captures images of the ground which are processed consecutively on-the-fly to count the number of targets along the flight path. Each image is processed using the proposed target-counting algorithm. First, targets' centers are detected in the current image; and second, the targets that were not covered in previous images are identified and counted. The performance of the algorithm depends on its ability to identify in the current image what targets were already counted in previous images and what targets were not, and this ability is affected by the limited accuracy of the UAV to stay on the flight path in the presence of wind. In the experimental evaluation, targets were distributed on ground on three different configurations: one line of targets along the flight path, parallel lines of targets at an angle with the flight path, and random. The accuracy of the target count was 96.0%, 88.9% and 91.9% respectively. The development of a transmission power control (TPC) protocol for wireless body area networks (WBANs) is proposed. The WBAN consists of wireless sensors attached to the user. Each sensor has a transceiver and an inertial measurement unit (IMU) to measure user's motion. The protocol increases the WBAN's lifetime by reducing the power consumption of the transceiver. The TPC protocol is based on a mathematical model of the human motion performed by the user. The protocol uses the model to determine the minimum transmission power required to achieve a packet delivery ratio (PDR). The TPC protocol uses the received signal strength indicator (RSSI) to characterize the channel. It uses IMU measurements to determine the parameters of the model and then decide on transmission power levels. Also, the TPC protocol includes a method to reduce the complexity of the human-motion model to reduce the calculations the wireless sensor has to perform. The TPC protocol is implemented and tested real-time on a Shimmer2r wireless sensor. Experimental results on a bicep-curl movement show that the average power per packet decreased from 31.3mW to 19.0mW, which is a reduction of 39%, while maintaining the PDR within a 4% difference from the target PDR. Focusing on movements of a human participant performing physical-therapy exercises, this paper presents an algorithm that predicts the received signal strength indicator (RSSI) of wireless sensor nodes attached to the user. The body area network (BAN) formed by the nodes is a motion capture system that measures joint angles of the user at the shoulder and elbow. In order to predict the RSSI, we first show that the wireless signal experiences severe attenuation from human body shadowing even though distances between transmitters and receiver are less than 3 meters. Second, we show that the RSSI fluctuates periodically with regular body movements (i.e., physical-therapy exercises). We then model the movements using k-means clustering and Markov chains and determine the probability distribution of the RSSI at each state in the movement. Finally, the RSSI is predicted with a maximum a posteriori probability (MAP) detector. Experimental results show that the RSSI can be predicted with a root mean square error (RMSE) of 3.7 dB, which is an error within 4.2% of the average RSSI level, and when a prediction is made, it is valid for the next 1083 milliseconds (ms) on average. 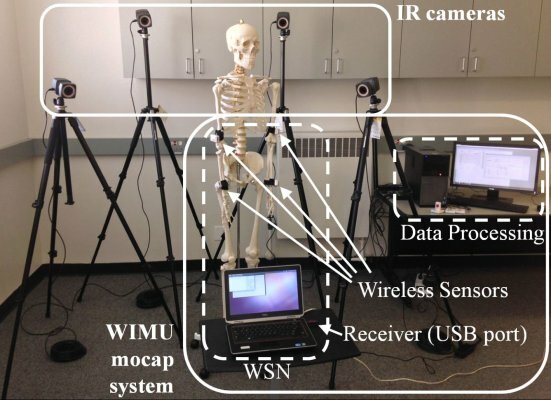 A measurement technique that decreases the root mean square error (RMSE) of measurements of human joint angles using a personal wireless sensor network (WSN) is reported. Its operation is based on virtual rotations of wireless sensors worn by the user, and it focuses on the arm, whose position is measured on 5 degrees of freedom (DOF). The wireless sensors use inertial magnetic units (IMU) that measure the alignment of the arm with the earth’s gravity and magnetic fields. Due to the biomechanical properties of human tissue (e.g., skin’s elasticity), the sensors’ orientation is shifted, and this shift affects the accuracy of measurements. In the proposed technique, the change of orientation is first modeled from linear regressions of data collected from 15 participants at different arm positions. Then, out of 8 body indices measured with dual-energy X-ray absorptiometry, the percentage of body fat is found to have the greatest correlation with the rate of change in sensors’ orientation. This finding enables us to estimate the change in sensors’ orientation from the user’s body fat percentage. Finally, an algorithm virtually rotates the sensors using quaternion theory with the objective of reducing the error. The proposed technique is validated with experiments on 5 different participants. In the DOF whose error decreased the most, the RMSE decreased from 2:20o to 0:87o. This is an improvement of 60%, and in the DOF whose error decreased the least, the RMSE decreased from 1:64o to 1:37o. This is an improvement of 16%. On average, the RMSE improved by 44%. In this paper, a game-theoretical framework for the design of distributed algorithms that control the transmission range (TR) of nodes in order to maximize throughput in Wireless Multihop Networks (WMN) is proposed. It is based on the stability region of the link-scheduling policy adopted for the network. The stability region is defined as the set of input-packet rates under which the queues in the network are stable (i.e., positive recurrent). The goal of the TR-control algorithms is to adapt the stability region to a given set of end-to-end flows. In the algorithms, the flows control distributively the nodes' TRs using the stability region in order to enable higher end-to-end packet rates while guaranteeing stability. In order to demonstrate how the algorithms can be designed using the proposed game-theoretical framework, a new TR-control algorithm for IEEE-802.16 WMNs is developed. Its convergence is demonstrated, and a performance bound is calculated. Finally, simulation results show that the algorithm is able to find the optimal TRs more effectively. The TRs achieve throughput levels that are at least 90 percent of the optimal throughput for 72 percent of the simulated scenarios, whereas the classic approach of spatial-reuse maximization does this for 62 percent of the scenarios. The development of a wireless sensor network (WSN) that measures joint angles of the human body is reported. Its principle of operation is based on measuring the alignment of the different segments of the limb being tracked with the earth's gravity and magnetic fields. The focus is on measurements at the shoulder and elbow joints. These are tracked with 3 and 2 degrees of freedom respectively. In order to validate the accuracy of the proposed WSN, experiments are performed with arm movements on each degree of freedom and the WSN's measurements are compared with those of a professional motion capture (mocap) system that uses infra-red (IR) cameras and markers. The average root mean square error (RMSE) across all degrees of freedom was found to be 1.39° and 2.18° when tested on a spherical coordinate system and human arm respectively. Finally, the causes for this increase on the RMSE are discussed in terms of the effects of the arm's skin and muscles on the alignment of the sensors. It is found that when the user performs the greatest efforts to make the movements, the WSN deviates the most from the IR mocap system. In the degree of freedom that is most affected, the RMSE increases from 0.96° to 2.62°. This is an increase of 173%. A major challenge in wireless networks is the ability to maximize the throughput. High throughput in a wireless network requires a relatively low complex scheduling policy with a provable efficiency ratio, which is a measure of the performance of the policy in terms of throughput and stability. For most scheduling policies that achieve provable ratios, at the onset of every frame, a selection is made of a subset of links to transmit data in the immediately following frame. In this paper, we propose a policy that allows links to transmit data in any future frame by means of frame reservations. The new, reservation-based distributed scheduling approach will improve the capacity of the system and provide greater throughput. First, we create a framework to analyze the stability of reservation-based scheduling systems. Then, to demonstrate its efficacy, we propose a reservation-based distributed scheduling policy for IEEE 802.16 mesh networks and use the new framework to find sufficient conditions for the stability of the network under this policy, i.e., we find a lower bound for its efficiency ratio. Finally, by means of simulation, we validate the mathematical analysis and compare the performance of our policy with nonreservation-based policies. Transmission power control in multihop wireless networks is a challenging problem due to the effects that different node transmission powers have across the layers of the protocol stack. In this paper, we study the problem of transmission power control in IEEE 802.16 mesh networks with distributed scheduling. We consider the effects of transmission power control on the link-scheduling performance when a set of end-to-end flows established in the network are given. The problem is approached by means of the stability region of the link-scheduling policy. Specifically, the stability region is adapted using transmission-power control to the paths of the flows. This adaptation enables the flows to support higher levels of data traffic under lower levels of end-to-end delay. To the best of our knowledge, the approach of stability-region-based transmission power control has not been studied before. We propose a heuristic transmission-power-control algorithm for solving the problem of adapting the stability region to the flows. It is shown, by means of simulation, that the algorithm outperforms the transmission power control based on spatial reuse, which is a widely used approach. Also, it is shown that the solution of the algorithm has performance close to the optimal solution for moderate-sized networks, i.e., networks with no more than 25 nodes and 25 flows. In this paper, we study the problem of transmission power control and its effects on the link-scheduling performance when a set of end-to-end flows established in the network are given. This problem is approached by means of the stability region of the link-scheduling policy. The stability region is defined for link-scheduling policies as the set of input-packet rates under which the queues in the network are stable (i.e., positive recurrent). Specifically, the link-scheduling's stability region is adapted to the paths of the flows such that the flows are able to support higher levels of data traffic under lower levels of end-to-end delay. To the best of our knowledge, the approach of transmission power control based on queue stability has not been studied before. Based on this approach, we propose a transmission-power-control algorithm. It is shown, by means of simulation, that the algorithm outperforms the transmission power control based on spatial reuse. Several distributed scheduling policies for wireless networks that achieve a provable efficiency ratio have been developed recently. These policies are characterized by the selection, at the onset of every time slot, of a subset of links according to the interference model of the network and the length of the links' queues. The selected subset of links is for the next time slot only. In this paper, we propose a new framework for the stability analysis of distributed scheduling policies that allow links to transmit data packets in any future time slots by means of slot reservations. Within this framework, we propose and analyze a reservation-based distributed scheduling policy for IEEE 802.16 mesh networks. We find sufficient conditions for the stability of the network when the traffic uses one hop. Specifically, we prove a lower bound for its efficiency ratio by evaluating the stability conditions obtained from our proposed framework. Finally, we compare this lower bound with the capacity achieved in simulation results. In this paper, a simulation model for IEEE 802.16 (WiMAX) wireless mesh networks with distributed scheduling is developed. It provides a framework for the evaluation of reservation-based distributed scheduling (RBDS) policies at the medium access control (MAC) layer. The simulation model, called WiMAX-RBDS-Sim, is developed under the OPNET event-driven simulation environment. It provides interfaces for the integration of RBDS policies and link-establishment algorithms. As an example of the use of WiMAX-RBDS-Sim, a new RBDS policy called Sliced-GM-RBDS is proposed and evaluated. This policy is based on the GM-RBDS policy proposed in . The WiMAX-RBDS-Sim simulation results show that Sliced-GM-RBDS outperforms GM-RBDS in terms of network stability. A link-establishment algorithm is also evaluated with WiMAX-RBDS-Sim to determine the time required for the completion of link establishments across the network. Finally, the performance of WiMAX-RBDS-Sim is evaluated in terms of simulation speed and memory usage. A constructivist simulation-based methodology for teaching mobile communication systems in the electrical engineering curriculum is reported. In this methodology, senior undergraduate students develop simulators under the guidance of an advisor, and the simulators are later used by other students to learn these particular technologies. Evaluations based on students' results and opinions demonstrate the effectiveness of the methodology for improving the teaching-learning process. In this paper, we report on a work-in-progress of an intelligent wireless mesh network backbone. We give a list of guidelines that should be considered for the design of such a network, and analyze them in the context of different application scenarios. We propose a backbone for these networks with the following characteristics: self-formation and maintenance, adaptability, and resiliency. A model for the backbone and a topology control scheme are proposed based on an analysis of the traffic flows generated by final users. Este artículo presenta una breve historia, aspectos técnicos básicos y aplicaciones de los sistemas de comunicaciones móviles. También hace una pequeña revisión a los nuevos sistemas de comunicaciones móviles disponibles en Colombia. En este articulo presentamos una metodologia simple para disenar bloques funcionales DSP basicos, y el estado del arte en arquitecturas para procesadores DSP y CPLDs-FPGAs orientados al diseno DSP.